For this tutorial we will design a poster using Layer Masks, clipping masks and the Liquify Tool to create a poster that is literally outside of the box! If you’re looking for more unique flyer designs, head on over to GraphicRiver for more. You’ll need access to Photoshop. If you don’t have the software, you can download a trial from the Adobe website. 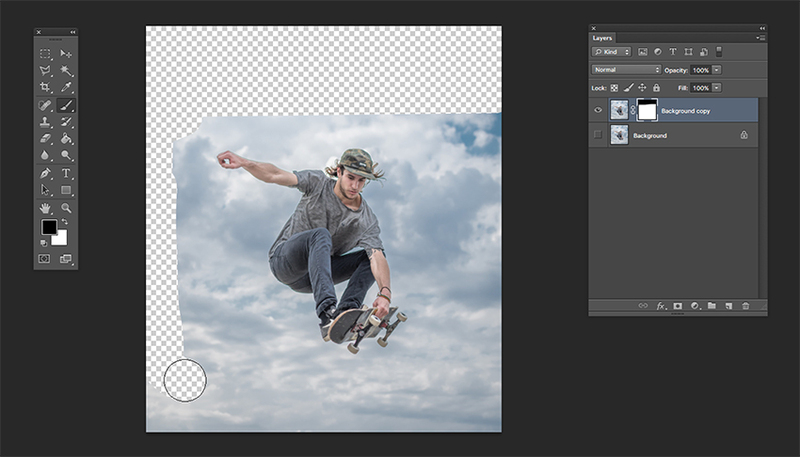 Open the skateboarder image in Photoshop. 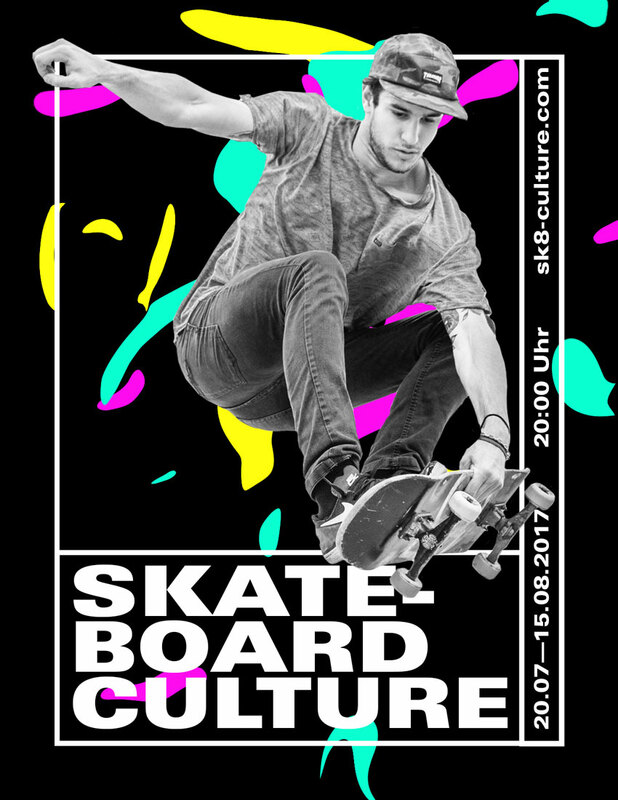 We want to remove the clouds before using the skateboarder image on the poster. To do this, in the Layers panel, Duplicate the Background layer by pressing Command-J and Hide the visibility of the original Background layer. While selecting the new Background copy layer on the Layers panel, click on the Vector Mask button to add a Layer Mask to Background copy. I recommend using the Brush Tool (B). 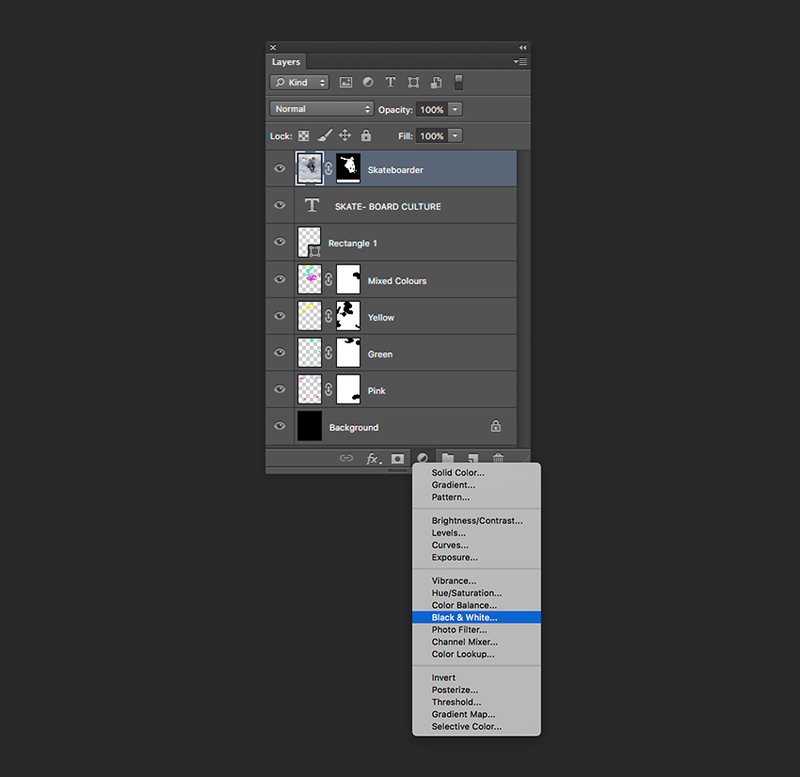 Using the Brush Tool (B) and black as Foreground Colour on the Tools panel, you can hide parts of the image. If you use white as a foreground colour, you will instead reveal parts of the image. I prefer this method instead of the Erase Tool as this gives me the option to go back and forth in revealing the image and fixing mistakes. 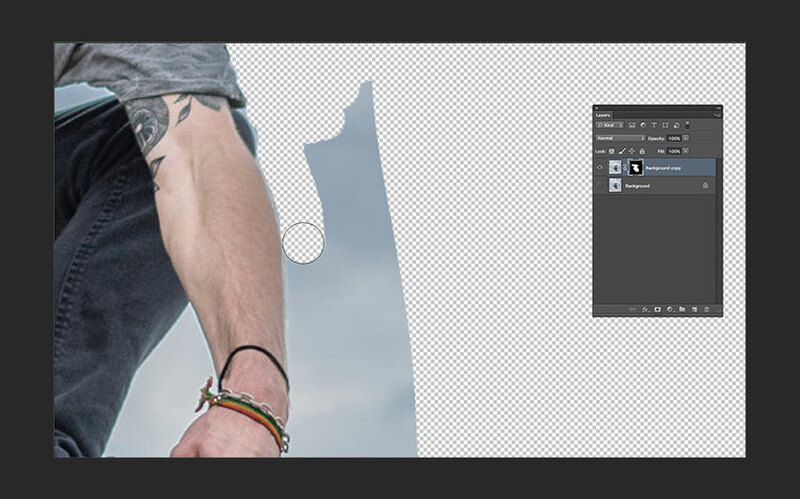 Right click to set the brush to a Size of 200 px and Hardness of 100% and start brushing parts away from the image. I like to do the big parts first to later zoom in and concentrate on the details around the body. Let’s Zoom In to work on the details. For this I go back and forth with the brush sizes as sometimes I need to get into corners, but I started with a Size of 30 px and Hardness of 100%. A great tool that helps here is using the backslash key () to get a red tint behind the image and know what parts need to be perfected. In Photoshop, go to File > New. 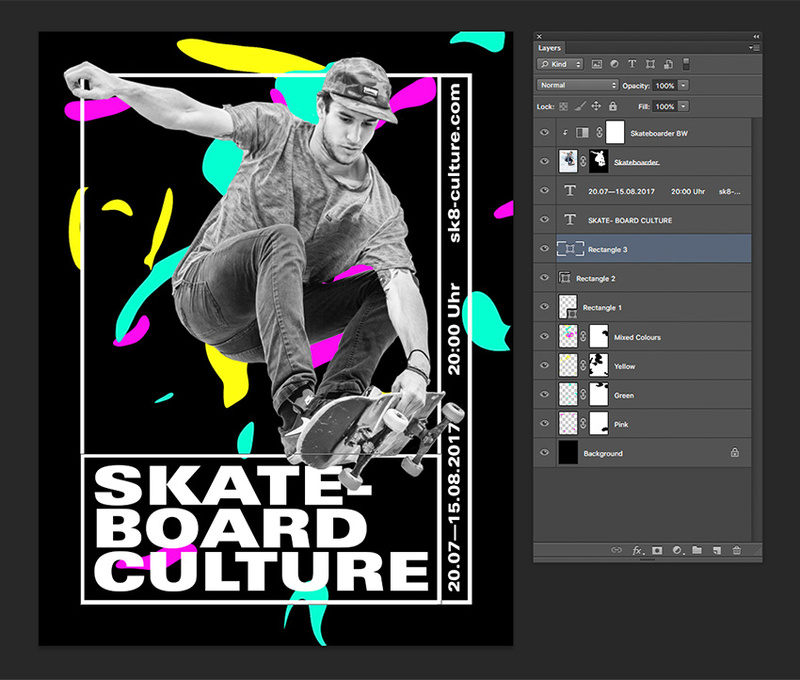 Name the document Skateboard Culture, and set the Width to 1275 px and Height to 1650 px, with Background Contents white. I am keeping the poster digital, so I will work with 72 dpi or 150 dpi. Click OK to create the document. Let’s create guides on our document to make sure things are aligned the way we want them to be. 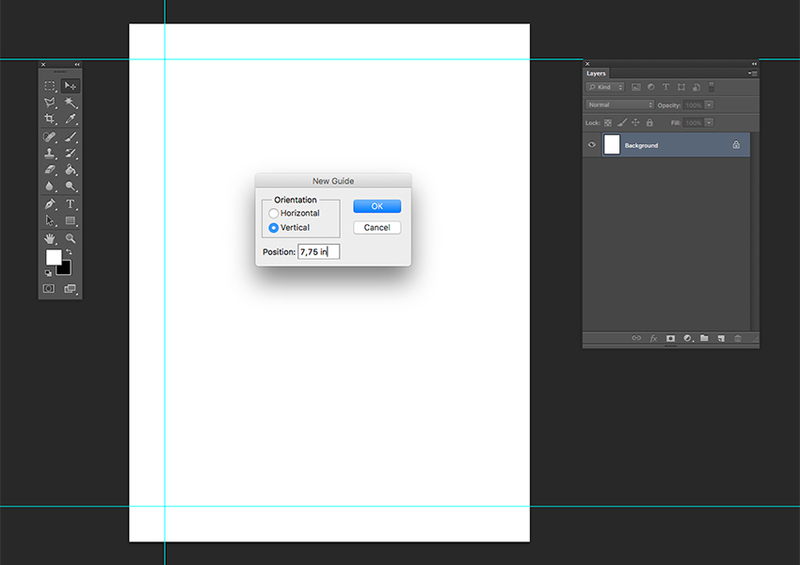 My ruler measures in Inches; you can change this in Photoshop > Preferences > Units and Rulers. We can head over to View > New Guide, where a new window will pop up. We want to make all of our Guides 0.75 inches from each edge. Select Horizontal and under Position type 0.75 in. Click OK.
We will do the same for the Vertical option. To add a guide to the bottom and right side of the page, we simply need to subtract 0.75 inches to the final measurement of your page. To hide and show the guides, hit Command-;. 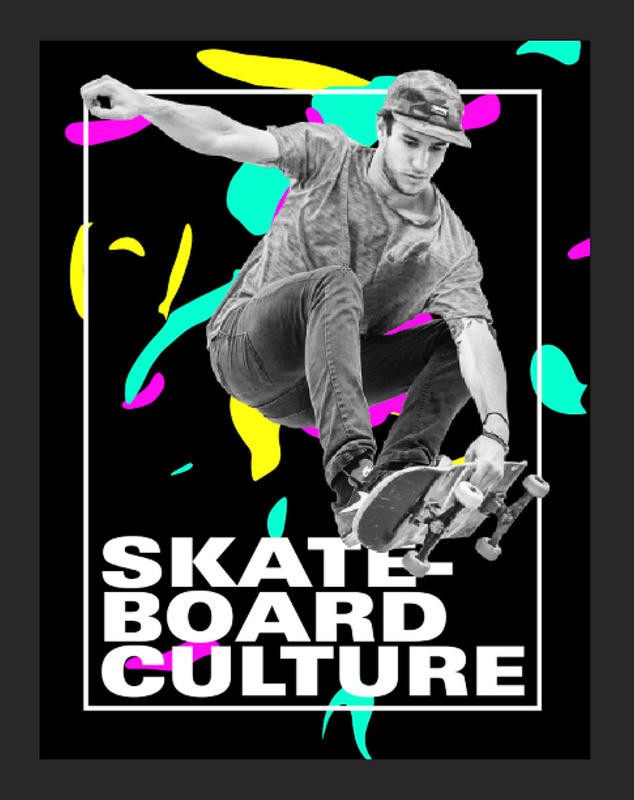 Let’s duplicate the skateboarder Background copy layer into our new Skateboard Culture file. 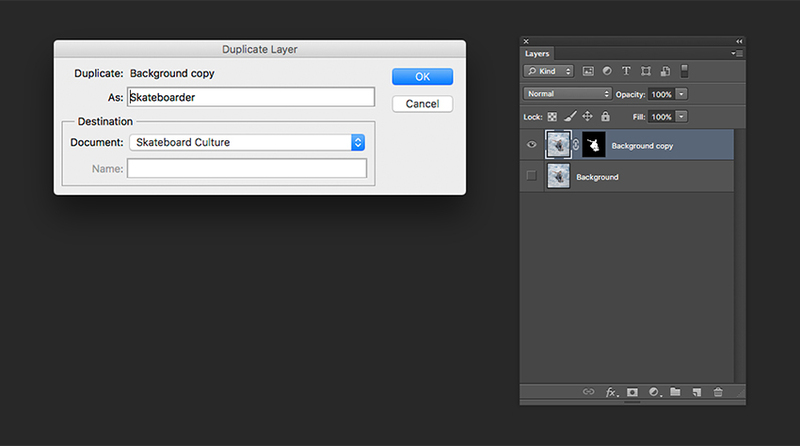 To do so, Right Click > Duplicate Layers. 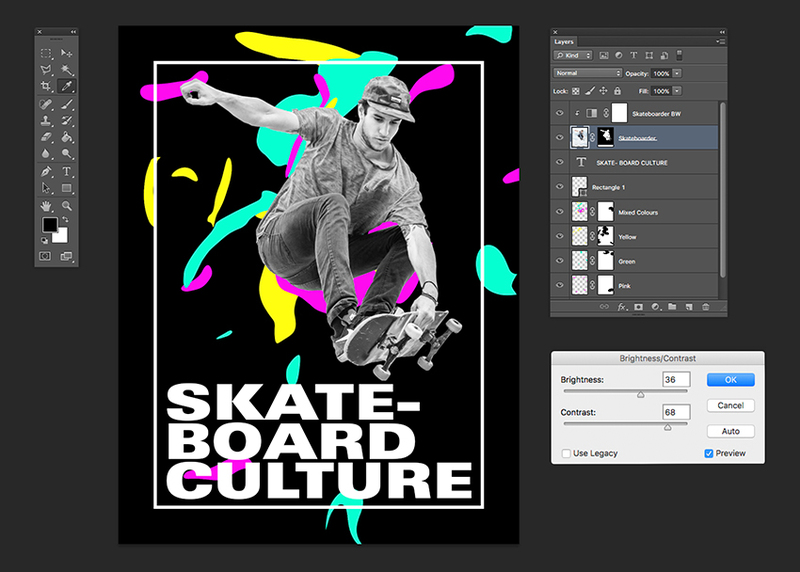 Under As:, rename the layer to Skateboarder, and under Destination select Document > Skateboard Culture. Click OK to continue. 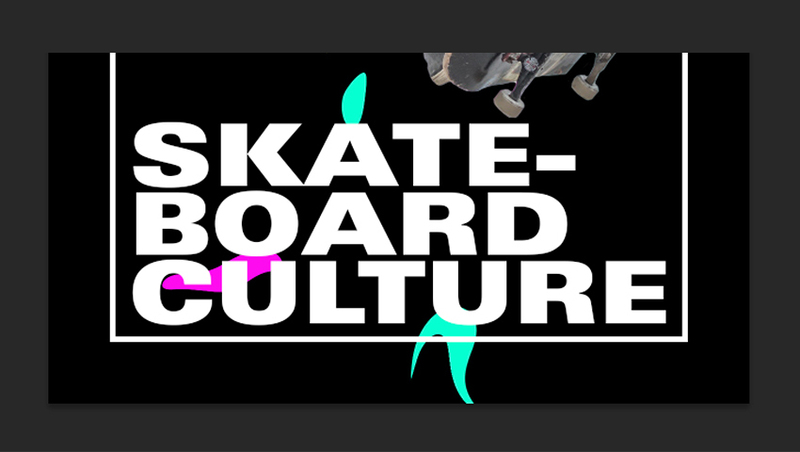 Let’s jump to our Skateboard Culture document. To make the poster jump out a bit more, let’s make the background black. Using the Paint Bucket Tool (G), select the background layer and click on the page to paint the poster. Selecting the background layer, let’s create a new layer in order to add coloured shapes. 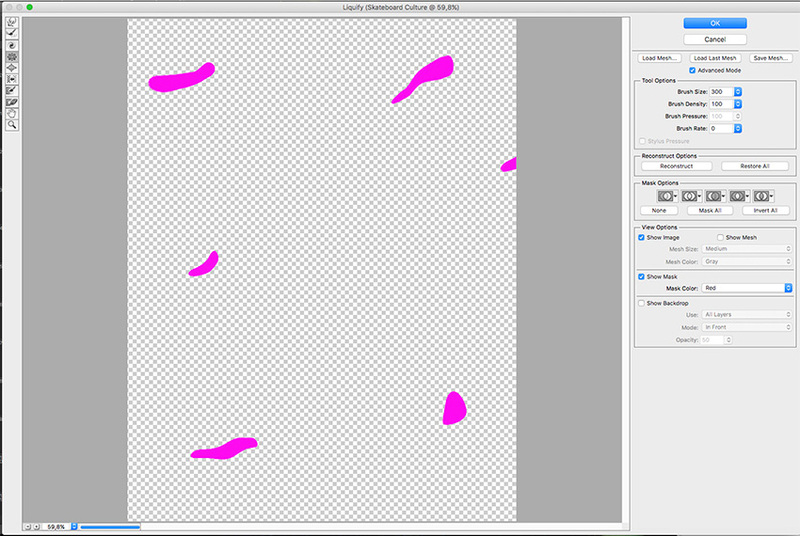 Press Shift-Command-N, and let’s name our new layer by the colours we will be using—in this instance, Pink. Make sure that under Color, None is selected. Let’s select a colour by clicking on Set Foreground Colour, and then set the colour code to #ff0cf0. Using the Brush Tool (B), set the Size to 125 px and Hardness to 100%. We can just create random brush strokes as below. 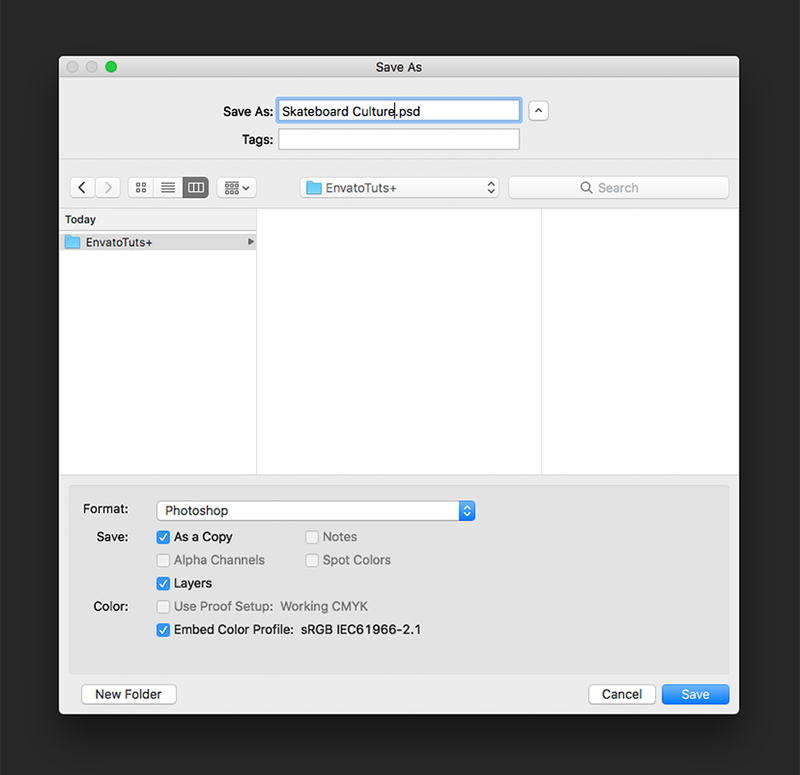 Filter > Liquify or Shift-Command-X, and a new window will pop up displaying the selected layer. In the left panel, use the Clock Twirl Clockwise Tool (C), and choose the following settings in the right panel: Brush Size: 300, Brush Density: 100, and Brush Pressure: 100. Use the brush over the strokes in this new window. The goal here is to create wobbly figures that can act as a background on the poster. There’s no wrong or right way to do it, so feel free to do it your own way! Feel free to also use the Forward Warp Tool (W), Pluck Tool (S), and Bloat Tool (B). Don’t worry about making it too perfect as we can use the Layer Mask later on to hide things we don’t want. Do the same with new layers for a green and a yellow colour with the following colour codes. Green: #0cffd1, Yellow: #0fffe10. 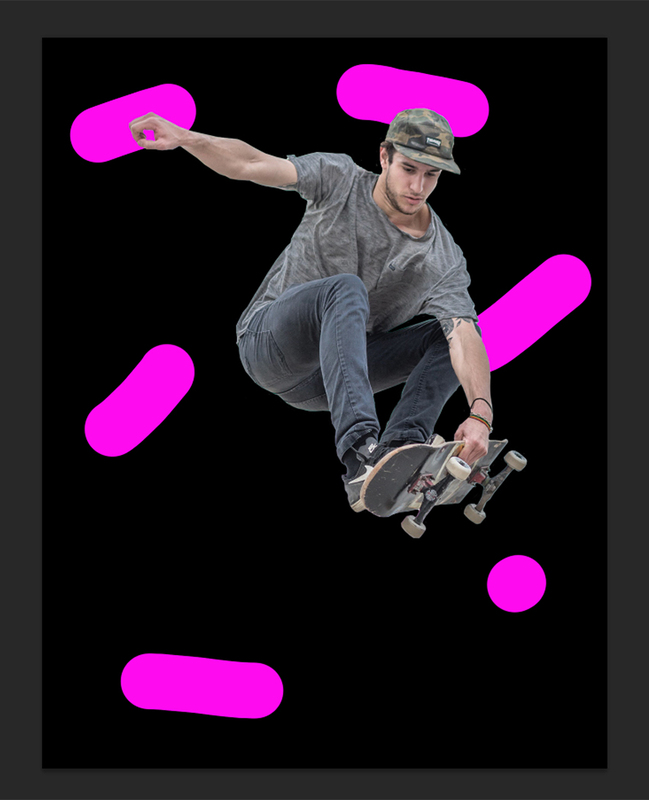 We can edit some of the shapes out by using the Layer Mask, the same method we used to clean out the initial image of the skateboarder layer. You can create Layer Masks on each coloured layer and use the Brush Tool (B) to hide or show certain parts of the layer. Let’s hide the coloured layers and create a New Layer. 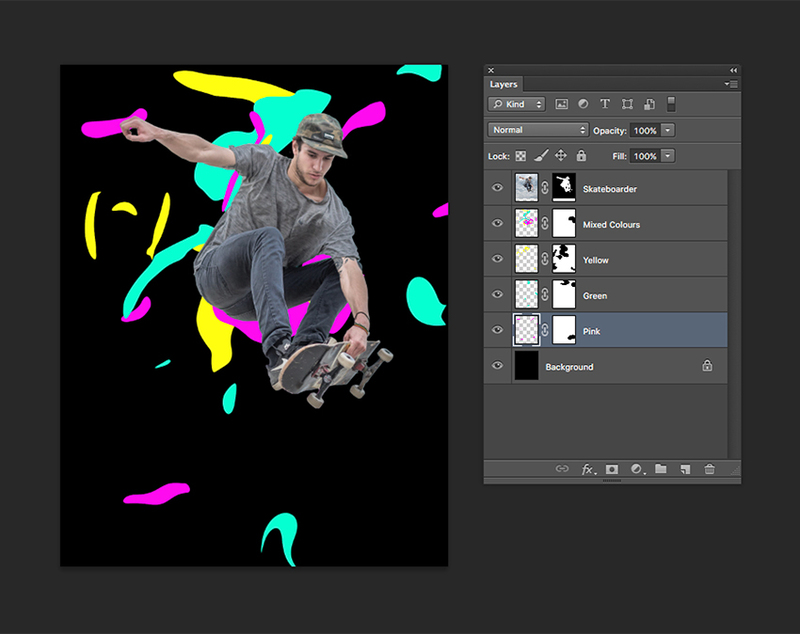 This new layer will contain strokes of each colour to be placed behind the skateboarder. We are doing this so we can Liquify all three colours at the same time. I am using a Brush Size of 250 px and Sharpness of 100%. We will proceed in the same way as for the coloured layers before with the Liquify Tool, playing around with it until you find something you like. You can play with the brush size in the new Liquify window. Again, there is no right or wrong! Once we have all these components, we can go back and edit with the aforementioned Layer Mask to balance these colours out. Using the Guides we created at the beginning of this tutorial, we will add some rigid lines to this funky poster. Let’s select our Mixed Colours layer and activate our guides again by pressing Command-;. In the Tools panel, click on the Rectangle Tool (U). Head over to the Options Bar. Set Fill to no colour, Stroke to white, and Shape Stroke Width to 5 pt. Create the rectangle based on the margin. We will come back to this shortly, but for now we will adjust and add a few things. Let’s hide our guides again by pressing Command-;. 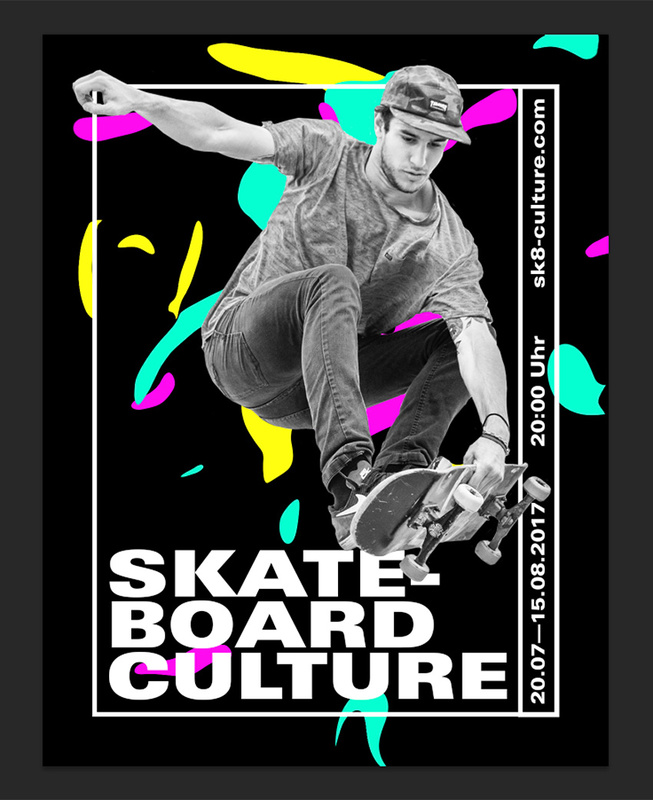 Using the Type Tool (T), type SKATE-BOARD CULTURE on three lines; this is to occupy more space at the bottom of the poster. On the Character panel, set the Font to Universe 93 Black Extended, Size 75 pt and Leading 60 pt. If you are using one of the alternative fonts, this will look a bit different, but anything works! Centre the text box in the rectangle we created. 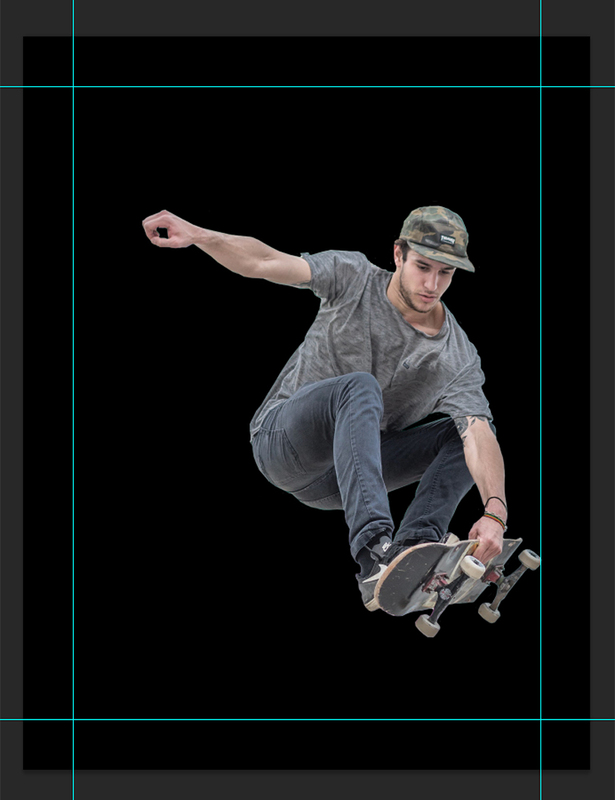 We want to create the illusion that the skateboarder is coming out of the page, and we also want to make him stand out from the busy background. We will clip a Black and White Layer Mask to the Skateboarder layer. Let’s start by selecting the Skateboarder layer. Go to the bottom of the Layers panel. Click Create new fill or adjustment layer and while pressing Alt, click on Black & White. A New Layer window will pop up. 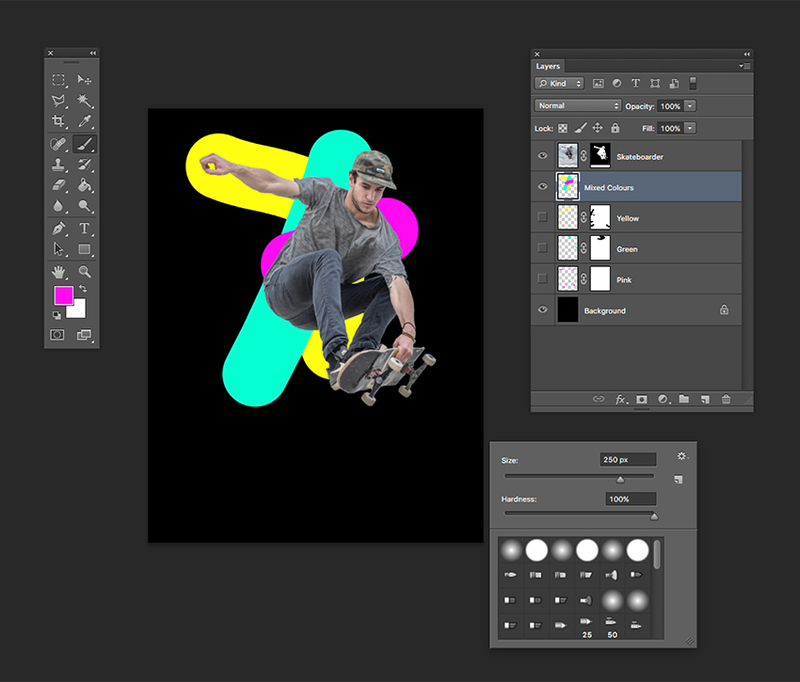 Name this new Layer Skateboarder BW, check Use Previous Layer to Create Clipping Mask, and click OK. 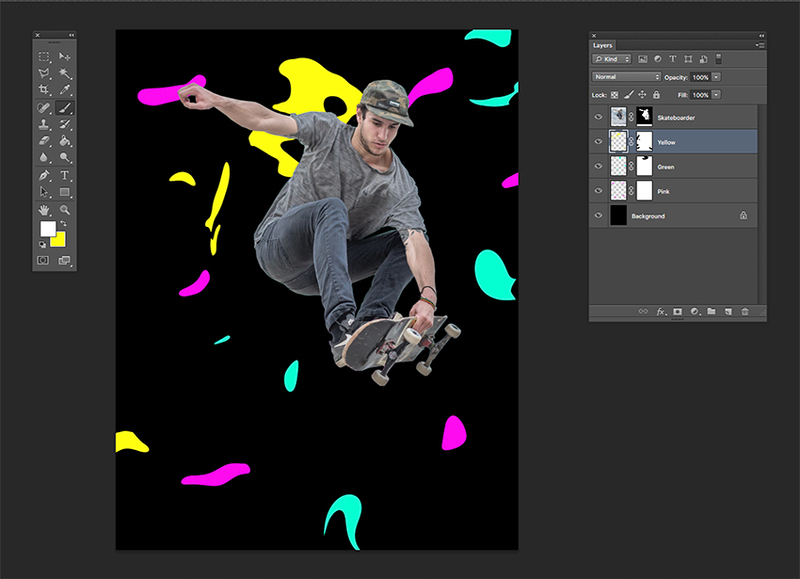 This will create a layer that will change the colour of only the Skateboarder layer to Black and White. Now we want to adjust the contrast. 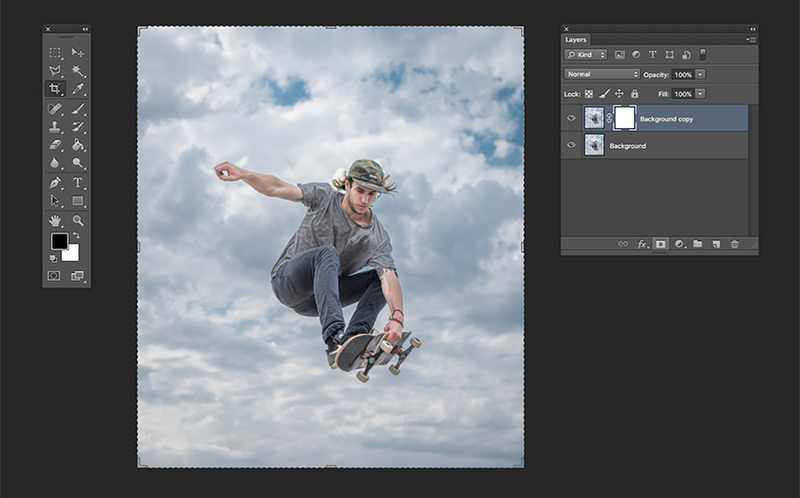 Select the initial Skateboarder layer, and head over to Image > Adjustments > Brightness and Contrast. I chose to go with Brightness: 36 and Contrast: 68 to make the photo pop. 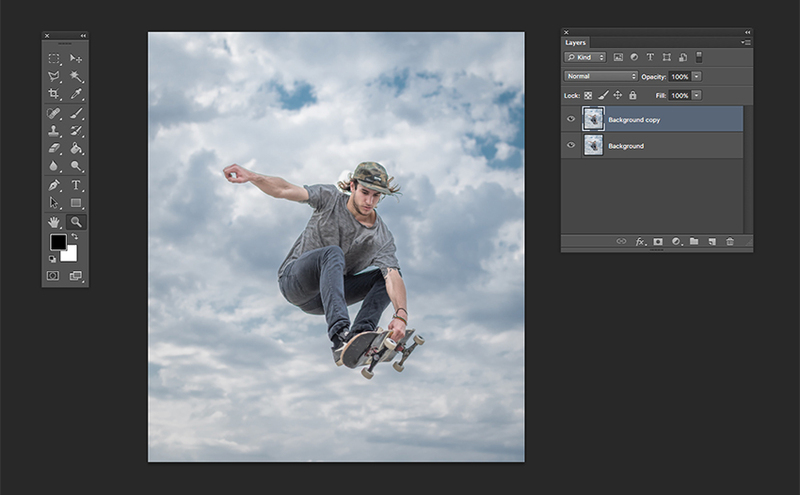 Click OK.
Now we want to resize the skateboarder slightly. While selecting the same layer, hit Command-T and, while holding Shift to keep the same proportions, click and drag from any of the corners to about 120% and reposition the image. 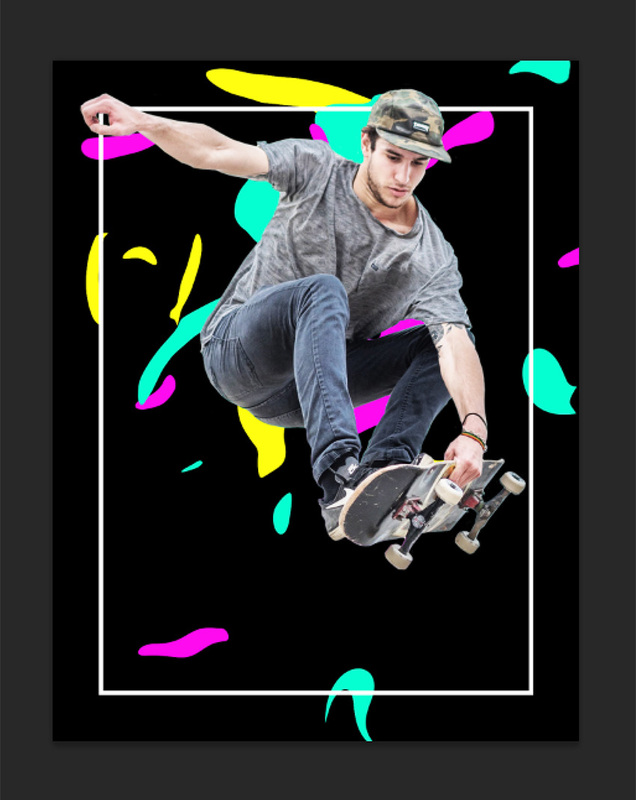 We want the image of the skateboarder to appear as if it is coming out of the rectangle we created previously. Let’s add a date and location for this poster. Select the Rectangle 1 Layer and create a new rectangle using the Rectangle Tool (U), this one vertically on the right side of the poster. 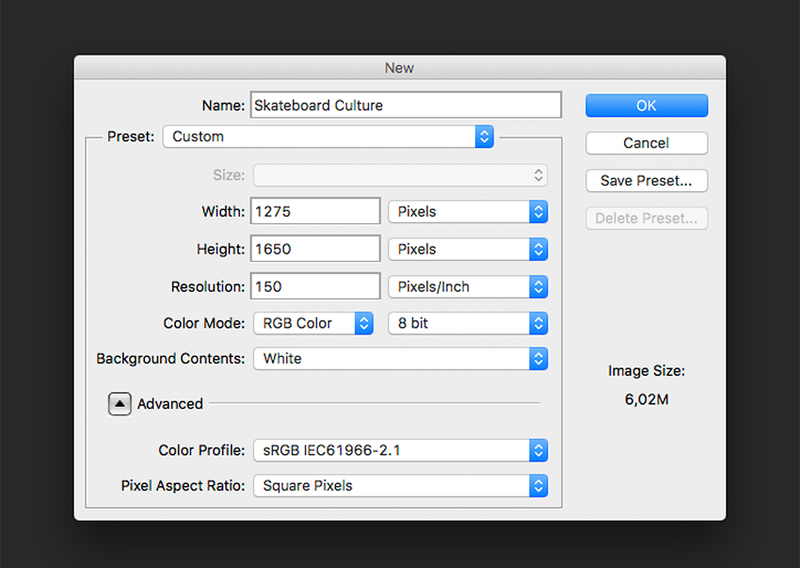 We can adjust our Skateboard Culture layer by pressing Command-T, holding Shift and resizing to keep the original proportions. Let’s add some made-up text to this rectangle with the Type Tool. Let’s add a date, time, and website. Once the information is in, hold Command, and the text box is going to turn into an object that we will be able to turn. Hold Command, head over to one of the text box’s corners, and click and rotate. Alternatively, you can hold Shift and turn the text box 90 degrees with precision. Let’s add a third rectangle over the title of the poster to match the right side. Your layers should be looking like the image below. Click File > Save to save the file as a .PSD to later edit it and as JPEG if you will be using it for social media. Use the image in a different way to create an outside-of-the-box poster. Use Layer Masks and Clipping Masks to edit colours on only one layer.